Please read on for all the latest news, photos, reports and fixtures! Under-21A: Greg Browne’s under-21A hurling team made an encouraging start to their championship campaign recently when beating Roscrea by sixteen points. The team is now awaiting a semi-final fixture. This year the under-21A hurling team is managed by Greg Browne (manager), Con Morris and Michael McNamara. 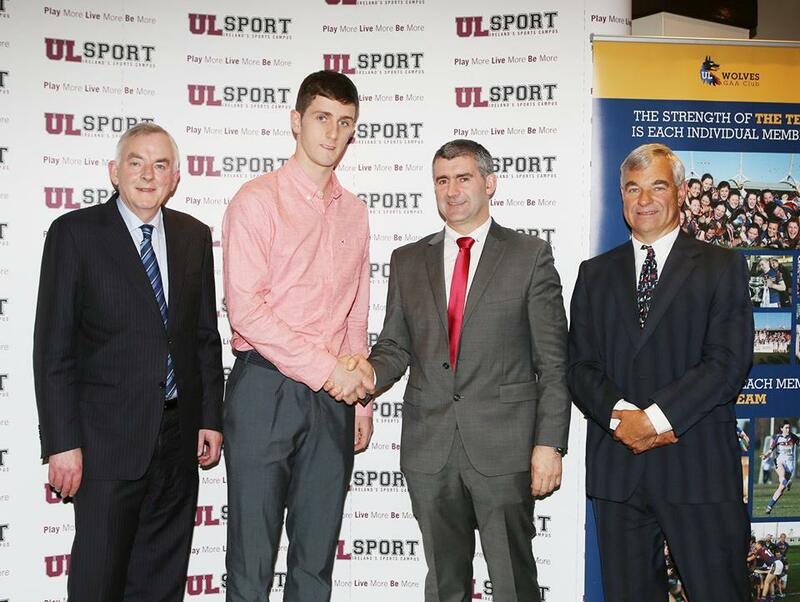 Congratulations: Well done to Nenagh Éire Óg’s Tommy and Barry Heffernan who were presented with University of Limerick GAA High Performance Scholarships at a ceremony in the Castletroy Park Hotel recently – on the evening both players received Bank of Ireland High Performance Scholarships and Munster Bursaries. Cúil Iomána na Bliana 2015: Michael Heffernan’s goal against Thurles Sarsfields in the recent county senior hurling final at Semple Stadium, Thurles is in the running for the prestigious TG4 GAA Beo Cúil Iomána na Bliana 2015 award. Mikey’s brilliant strike is up against goals from Séamus Callanan (Tipperary), Aaron Cunningham (Clare), Joe Canning (Galway), Maurice Shanahan (Waterford), David O’Callaghan (Dublin), TJ Reid (Kilkenny), John O’Dwyer (Tipperary) and Shane Bennett (Waterford). The competition will be decided by a public vote. To watch Mikey’s goal please click here. You can show your support for Mikey by clicking on the ‘Votáil don cúl seo/Vote for this goal’ button directly under the video. Your support is always appreciated. Newsletter: The October edition of the Nenagh Éire Óg monthly newsletter is now available to download. This latest edition celebrates the achievements of the senior hurling team and the junior A Camogie team while also highlighting the recent Dermot Early Leadership Initiative hosted by the club. This edition also takes a look back at the 2008 county minor A hurling final success. Our thanks go to the club communications sub-committee, in particular to Catherine McTiernan and Enda O’Sullivan, for pulling all of this publication together. To download your copy of the October edition of the monthly newsletter please see the club website. Night at the Dogs: A huge thank you goes out to everyone who contributed in any way to the combined juvenile and Camogie club ‘Night at the Dogs’ club fundraiser on Saturday night at the Thurles Greyhound Stadium. The event was deemed a huge success. AGM: The Nenagh Éire Óg Annual General Meeting (AGM) will be held on Wednesday, December 16th at 8pm in the MacDonagh Park Complex. Nomination forms and forms for notices of motion are available from the club secretary Anne Kennedy – email secretary.nenagheireog.tipperary@gaa.ie. Nomination forms and notices of motion should be returned no later than 9pm on Friday, December 4th. Well done to Nenagh Éire Óg’s Tommy and Barry Heffernan who were presented with University of Limerick GAA High Performance Scholarships at a ceremony in the Castletroy Park Hotel recently – on the evening both players received Bank of Ireland High Performance Scholarships and Munster Bursaries. Tommy Heffernan is pictured above accepting his award from Robert Frost (Munster Council Chairman). 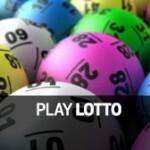 Last week’s lotto jackpot of €1,200 was not won. The €50 lucky dip winners were: David Ryan (c/o Nenagh Guardian), Paudie O’Kennedy (Church Road), Shane Brophy (c/o Nenagh Guardian), Pauline Delaney (Knockanpierce) & Roisín Whelan (Ormond Keep). Please support the Blues and play our club lotto. The Nenagh Éire Óg Club Lotto represents the club’s key fundraising initiative. Please consider supporting the Blues by playing our club lotto online: click here! Just watch how far we can stretch your €2! 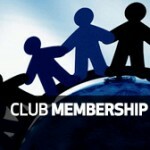 Alternatively you can also support Nenagh Éire Óg by paying your club membership. Membership for 2014 is now due and can be paid to any club officer or online. 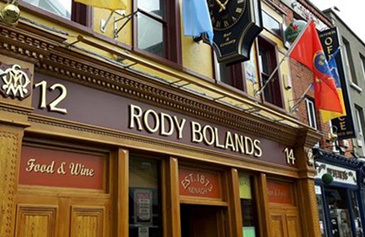 The cost of membership is priced at €25. Michael Heffernan’s goal against Thurles Sarsfields in the recent county senior hurling final at Semple Stadium, Thurles is in the running for the prestigious TG4 GAA Beo Cúil Iomána na Bliana 2015 award. Mikey’s brilliant strike is up against goals from Séamus Callanan (Tipperary), Aaron Cunningham (Clare), Joe Canning (Galway), Maurice Shanahan (Waterford), David O’Callaghan (Dublin), TJ Reid (Kilkenny), John O’Dwyer (Tipperary) and Shane Bennett (Waterford). The competition will be decided by a public vote. To watch Mikey’s goal please click here. You can show your support for Mikey by clicking on the ‘Votáil don cúl seo/Vote for this goal’ button directly under the video. Your support is always appreciated. AGM: The Camogie club AGM is due to take place on Thursday, November 26th in the clubhouse at 7pm – if you are interested in getting involved in the club in any way or if you have any motions or nominations please contact any committee member or email us at eireognenagh@gmail.com. Strength & Conditioning: Our strength and conditioning training continues on Tuesday nights when we train in the running track at Ballygreigue. Under-10s and under-12s train from 7.30pm to 8pm while all players from under-14 upwards train from 8pm to 8.30pm. On Friday evenings we are training in the complex in MacDonagh Park from 7pm to 7.30pm for under-10s and under-12s while everyone from under-14 up trains from 8pm to 8.30pm. 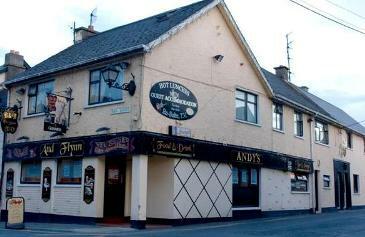 It costs €2 per evening and is run in conjunction with the juvenile club. Night at the Dogs: In conjunction with the adult and juvenile club we held a very successful ‘Night at the Dogs’ event on Saturday evening last in Thurles. We wish to thank all our ticket sellers, those who helped organise the event and those who showed up to support the event. Well done to Nenagh Éire Óg’s Tommy and Barry Heffernan who were presented with University of Limerick GAA High Performance Scholarships at a ceremony in the Castletroy Park Hotel recently – on the evening both players received Bank of Ireland High Performance Scholarships and Munster Bursaries. 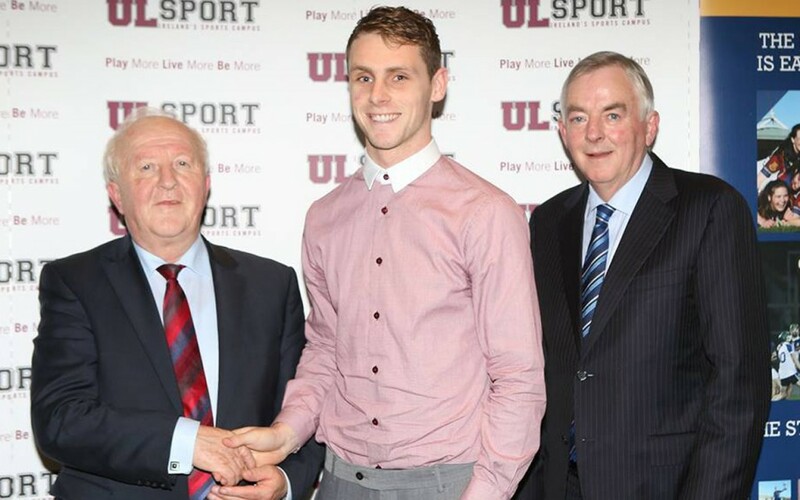 Barry Heffernan is pictured above accepting his award from Professor Don Barry (President, UL), Liam Sheedy (Area Manager Midwest Region, Bank of Ireland) and Dave Mahedy (Director of Sport, UL). A huge thank you to everybody who contributed to the success of the club’s ‘Night at the Dogs’. Your contribution to the club is very much appreciated and we hope that you had a great night out! Strength and conditioning continues at the usual times. 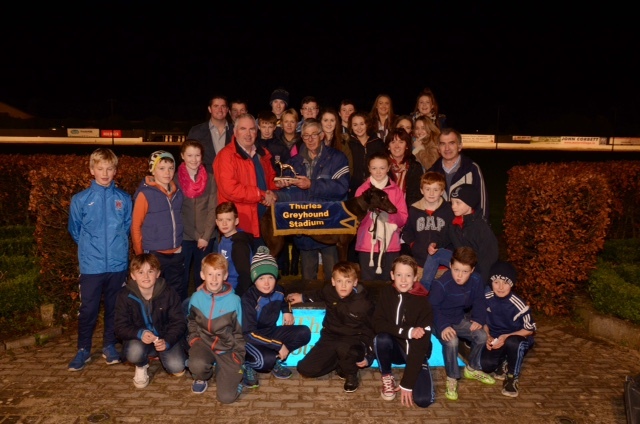 Jim Nagle (chairman of Nenagh Éire Óg) pictured making a presentation to Peter Wheatland after Talavara Jill won the Nenagh Éire Óg GAA Buster Race at Thurles Greyhound Stadium. Also pictured are Emer Dunne and members of the Nenagh Éire Óg GAA Club. Nenagh Handball Club will host an open night on Friday, November 27th at 7pm in the Éire Óg complex. We would especially like to see boys and girls born 2003/04/05, but all are welcome to come along, have a go and see what it’s all about. Refreshments will be served on the night. Hard luck to Sinéad Meagher who lost out in a very close Munster semi-final representing St. Mary’s Convent Secondary. The Nenagh Éire Óg website has now been developed to host each and every edition of the monthly newsletter – please see here for more. If you have any photographs, news or other information that you would like to see included please email eireognenagh@gmail.com. Thanks again to the club communications sub-committee and in particular to Catherine McTiernan and Enda O’Sullivan for pulling all of this information together. Commiserations to the Nenagh Éire Óg minor A Camogie team which exited at the semi-final stage of the championship following a defeat suffered at the hands of Newport-Ballinahinch on Sunday afternoon. There has been more encouraging news, however, with a goal by Michael Heffernan nominated for the Cúil Iomána na Bliana 2015 award. Please read on for all the latest news, photos, reports and fixtures! The under-21A hurling team made an encouraging start to their championship campaign on Saturday while the Blues’ minor A Camogie team are preparing this week to take on Newport-Ballinahinch in a county semi-final. In other news the club was delighted to learn this week that Ger Gavin will be presented with a Sean Ghael award at The Dome on Sunday, November 15th. Please read on for all the latest news, photos, reports and fixtures! 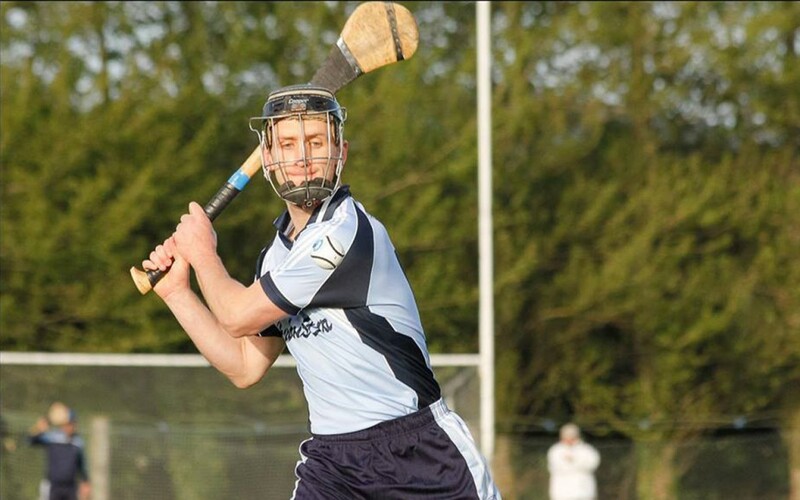 Greg Browne’s under-21A hurling team made an encouraging start to their championship campaign on Saturday afternoon in Moneygall when beating Roscrea by sixteen points. Greg Browne’s under-21A hurling team are preparing this week to launch their championship campaign while the minor A Camogie team are looking forward to a county semi-final against Newport. Our congratulations also go to Nenagh Handball Club’s Sinéad Meagher who has been crowned All-Ireland under-16 champion. Please read on for all the latest news, photos, reports and fixtures! Nenagh Éire Óg and Drom & Inch faced off in the final game of the round robin series and with both sides already through Sunday’s fixture was merely to decide the final group placings – in the end Drom & Inch won with a point to spare.